Somedays, many days actually, I set my own rules. They’re little rules. The world won’t end if they’re not followed, but they help my projects get finished. I also have to reward me for following these little rules. Luckily, the reward is often working on a newer project. 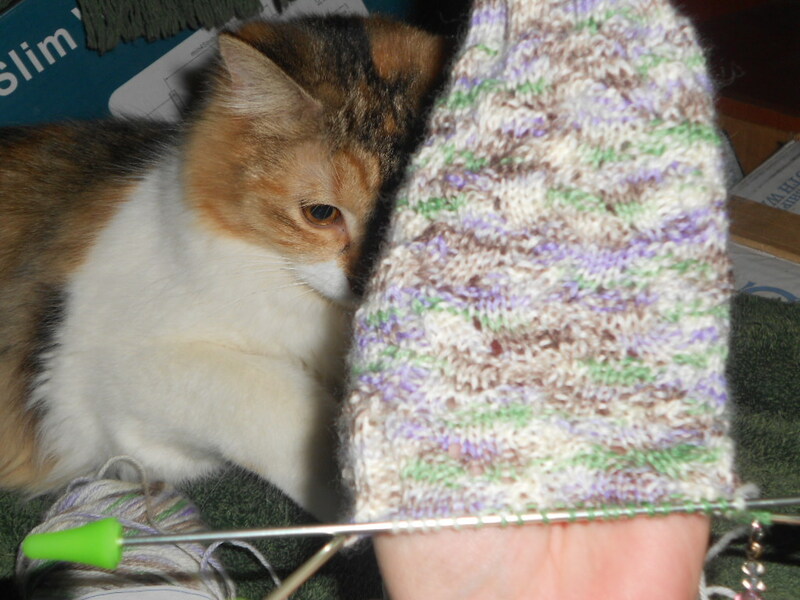 I wasn’t making much progress on socks that had a relatively simple repeating pattern. I had begun sewing quilts. I finished one quilt, and decided I would tie finishing the sock to the sewing of the quilt. I made a simple rule. I would only work on the quilt after I put in one full pattern repeat, or knit eight rows on the sock on non-work nights. Only after that could I work on the quilt. The quilt, which I cannot show you yet, is still new and a new creation. It holds a certain sense of wonder and appeal. The sock is new and my first pair of pink socks and quite pretty, but I’ve knit 70 stitches in the round before, in a lace pattern, and sometimes, you feel as if you are simply traveling in circles. Then, if you stick with it, you realize you’ve made progress. But sometimes, I require little rules, with little rewards to continue as required. Why does this matter? Why would I spend our time talking about these little rules? Because maybe there are other knitters like me. Maybe other knitters begin to feel their project is much of the same as it was the last few times you knit these eight rows. After all, we are only knitting them nine times. And this pattern is simpler than I expected. And my attention wanders to that beautiful fantasy quilt I can only mention carefully as it is a super-secret project for someone quite special. Perhaps the secretive nature of the project helps it hold appeal. The socks aren’t secret. They’re for me, they’re for teaching school on days I substitute, or for wearing to class on days I don’t have to work to match a favorite shirt and blazer. But there’s no secret about them. However, I do get to share pictures, whereas, the super-secret fantasy quilt has to stay under wraps, though I may start taking pictures and writing up separate blog posts about making it. I will probably be grateful to myself for exerting this much discipline later. Note to self: get good pics of the super-secret fantasy quilt. I can’t wait to see the finished project. I don’t even know what it looks like. For now, let me show you where I’ve gotten to with these not-so-secret happy class/teaching day socks for me. I still deserve a gift, made just for me. Its one of those reasons I set these rules for myself, and allow myself the reward of sewing the super-secret fantasy quilt on breaks at work, since I don’t have time on those breaks to complete enough of a row or rows on my sock to leave it at a comfortable spot. Now, to return to knitting those eight rows before I return to my quilt. Sock knitting with repeated patterns can get interesting to track. With simple knit in the round socks, or even ribbed socks, you simply keep knitting until the leg reaches X” from the cuff. 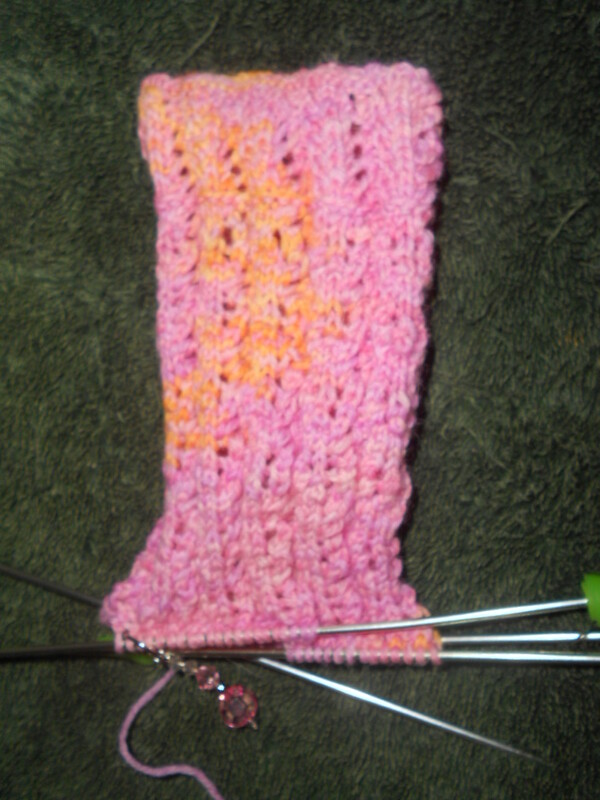 I usually add the cuff to the total and knit for that many inches, about 7-9 inches. 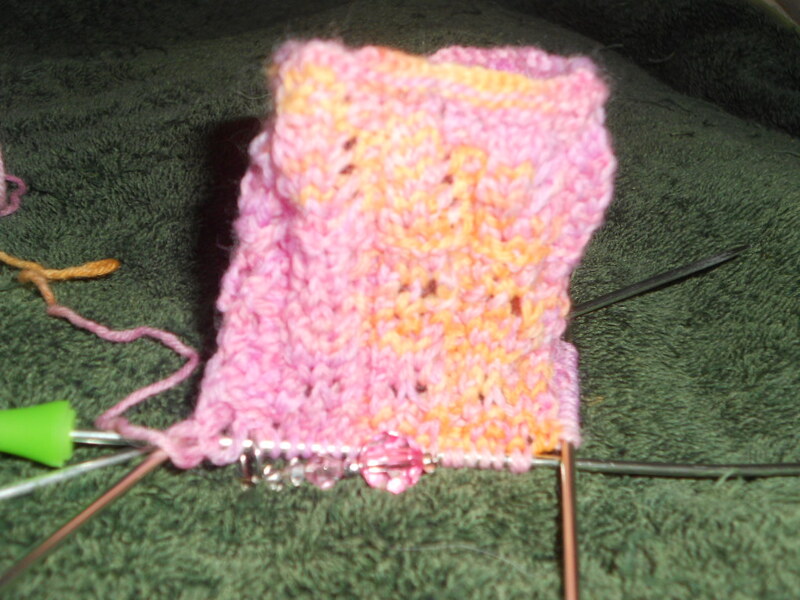 To confirm, I knit top-down or from the cuff to the heel then the toe, on double-pointed needles. It was how I learned. My first pair of socks was knit simply in the round after making a lumpy cuff. You don’t have to worry about how many rows, or which row of the pattern you are on. My second pair of socks was the vanilla latte socks in a knit 6, purl 2 rib; I used the same ribbing pattern for the cuff. 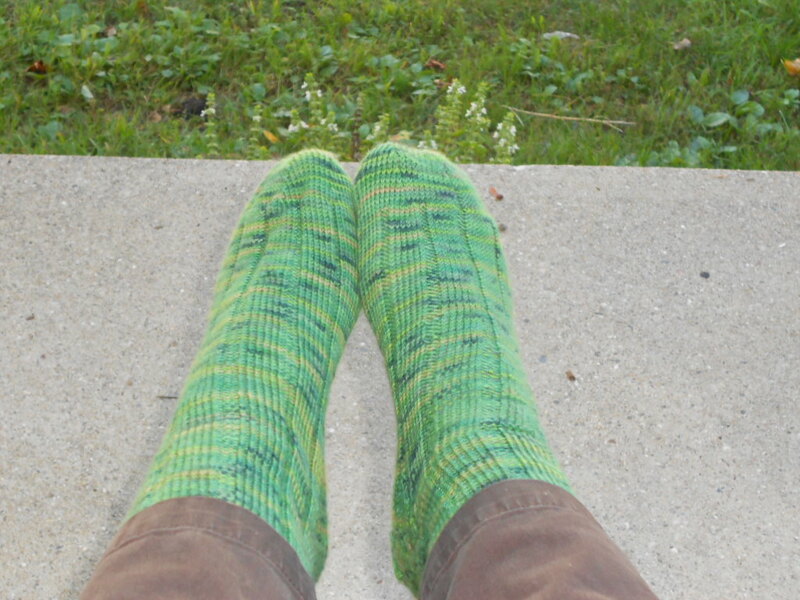 Again, I knit for 8.25” or something close and measured each sock against the other, and love, love, love these socks. Then I moved onto the almondine lace pattern repeat in the Sock Knitting: Master Class book I received as a gift. This one wasn’t too bad to follow. The pattern had sixteen repeats over a grid, so I only had to track about five total repeats to get the length I needed. I used hash marks next to the row. I considered using a row counter a couple of times, but decided against it. Reasons I do not use a row counter…1) I have enough stuff to take with me already. 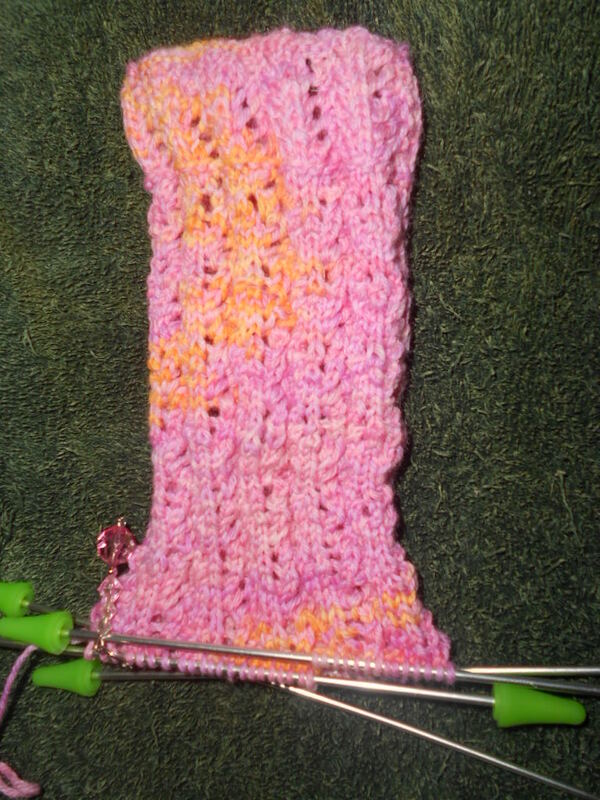 2) I will forget to use it and have to “estimate” rows I’ve knitted. 3) I’ve become a fan of a working copy of the pattern and since I’m following that, keep a pen clipped and mark the row. 4) I will lose it, they’re small and portable and adept at landing under the seat in the car. 5) I have a kitten-Scamp makes enough toys out of my project. 6) Pen and paper cost less. I think I’ve given enough reasons. I do make a working copy of my pattern. I often make two copies, just in case. I’ve never found one of anything particularly useful, especially socks. So, why not two? I know, you guys can give me fifteen things I only need one of, but that’s not really the point. I like two working copies. If I leave one in a classroom , or at the Secretary of State, I’m not stranded until I can get back to it. I just need to remember where I was in the pattern and mark my progress. If the pattern gets too marked up, I can use the cleaner copy for the next one. I feel I’ve made my case for my working copies here, now lets get on to tracking these lace repeats. Then I moved onto the almondine lace pattern repeat in the Sock Knitting: Master Class book I received as a gift. This one wasn’t too bad to follow. The pattern had sixteen repeats, so I only had to track about five total repeats to get the length I needed. I used hash marks next to the row. I considered using a row counter a couple of times, but decided against it. Reasons not to use a row counter…1) I have enough stuff to take with me already. 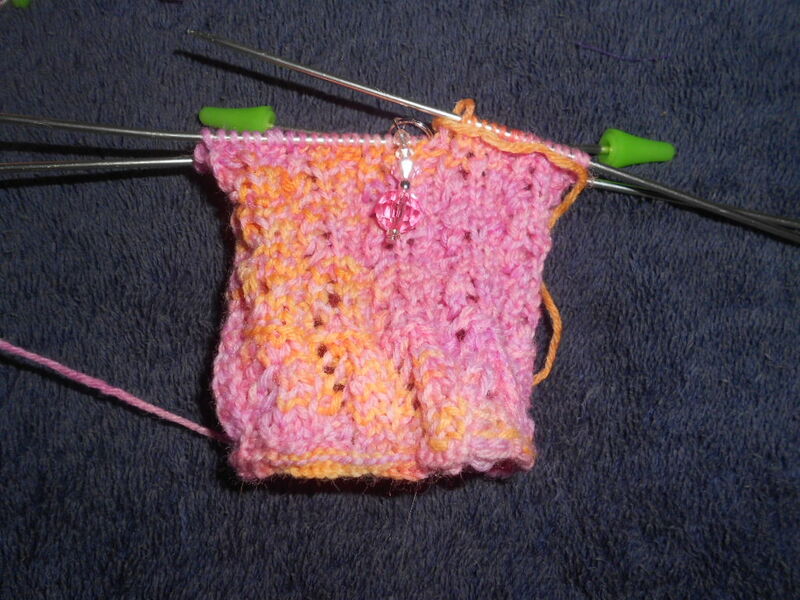 2) I will forget to use it and have to “estimate” rows I’ve knitted. 3) I’ve become a fan of a working copy of the pattern and since I’m following that, keep a pen clipped and mark the row. 4) I will lose it, they’re small and portable and adept at landing under the seat in the car. 5) I have a kitten-Scamp makes enough toys out of my project. 6) Pen and paper cost less. The almondine pattern I used had a grid pattern to it. I placed the hash marks next to the grid, and never really thought about the tracking. Now, I am working with a slightly simpler lace pattern, repeated over eight rows, with four of those rows having the same stitch. This sock designer simply wrote her instructions by rows. I now have to make 9 repeats of eight rows. 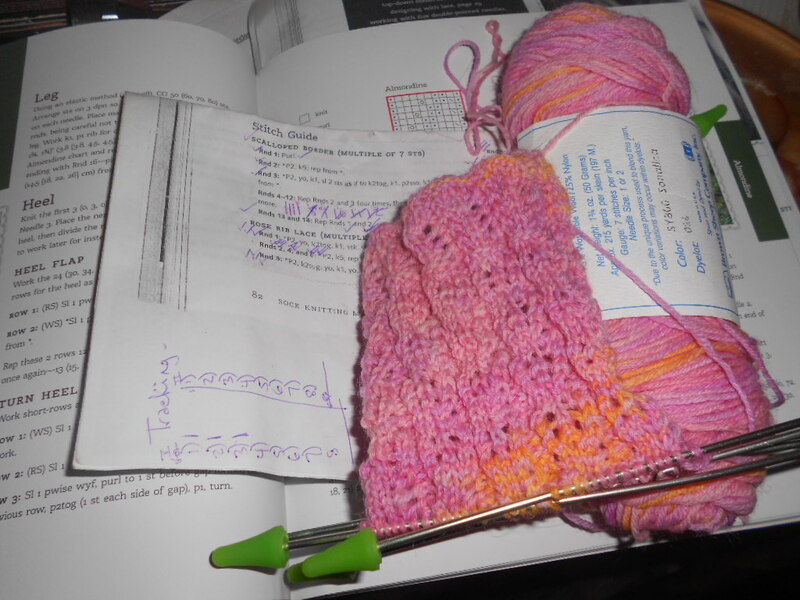 My working pattern is getting sloppy and difficult to track as I finish the fourth repeat of the pattern. I wasn’t certain I’d still be able to read the pattern if I continued putting check marks next to each row listed somewhere within the pattern text. Since I am against a row counter, and will likely forget it if I have it, I need another system. This gets kind of fun, because I am not good at setting up systems to keep things organized. Hence, why I didn’t see this problem until the messy fourth repeat of the pattern. So, I simply fell back on what worked. I used hash and tally marks before, when tracking multiple rows. I will continue to do so now. If you look closely, you can see where I started tracking on the rows and realized it would not work. I simply made a T-chart, albeit sideways, on the bottom of my working copy, and wrote a roman numeral I for sock #1, and a roman numeral II for sock number 2. Then I proceeded to write 1-8 in vertical rows beneath each sock designator and have a space for tally marks as I complete each row, without making my pattern less readable. I enjoy simpler solutions like this, and hope you find this helpful, or even a bit amusing. If you have a simpler way of tracking, sans row counter, I’m interested. Please note, I’m not good at just remembering or figuring out where I am in the pattern. I have enough other frustrations in my day that I wish to keep knitting socks for relaxation and valuation of self. Where Has She Gone? What’s She Been Doing? The bookwrap has gone everywhere with me this spring and summer and visited the ball parks, the new job, the short but frequent breaks…you name it, I’ve taken it, except out to dinner. Because, like knitting, sewing and food do not get along. Now to explain a little more about this bookwrap, because no one wants to just hear a simple description of black and white text info. I will include pictures below. I saw this pattern in a magazine, and I thought it was neat. But I thought the hexagon too simple and I’d promised a friend a hand-made item this year. And well, I’m looking into making quilts for my nieces. I decided I would see how much work this would really take. I requested her favorite color-purple, and she liked octopi…let the adventure begin. I began to cut and shape and draw the octopus after studying those with top-hats and a monocle. My friend has always enjoyed quirky creations. I began to cut fabric and sandwich layers and decided on a quilting pattern. 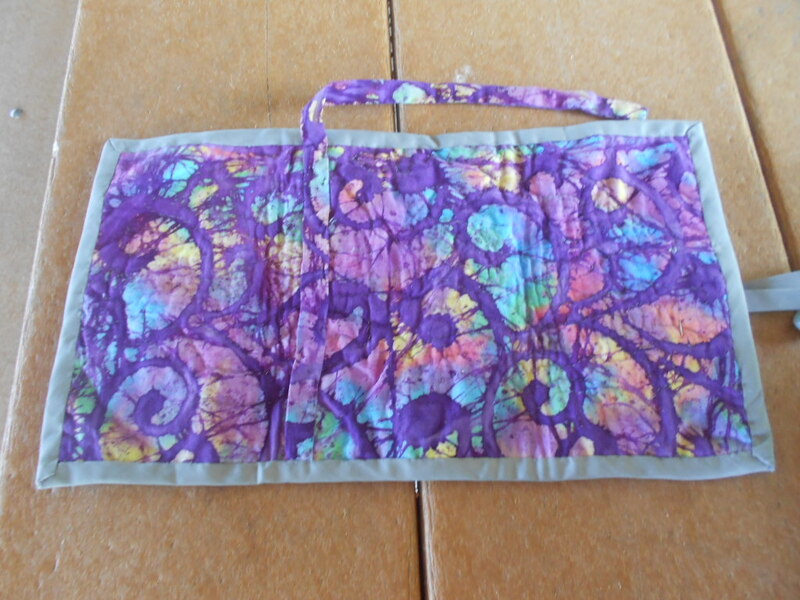 I began deciding on a wave pattern, since the character was on octopus and the background was a purple batik with bright blues and yellows and pinks running through it. It almost reminds me of the deep ocean where this octopus would likely dwell. It took a little time to quilt, and I didn’t have to baste much, if any, as the finished quilt was 17”x9”. The project traveled well with a small circular frame in which the waves began to look like octopus arms, and so, I essentially quilted an octopus on this quilt, who was tipping his hat, and reading a book. It felt appropriate. 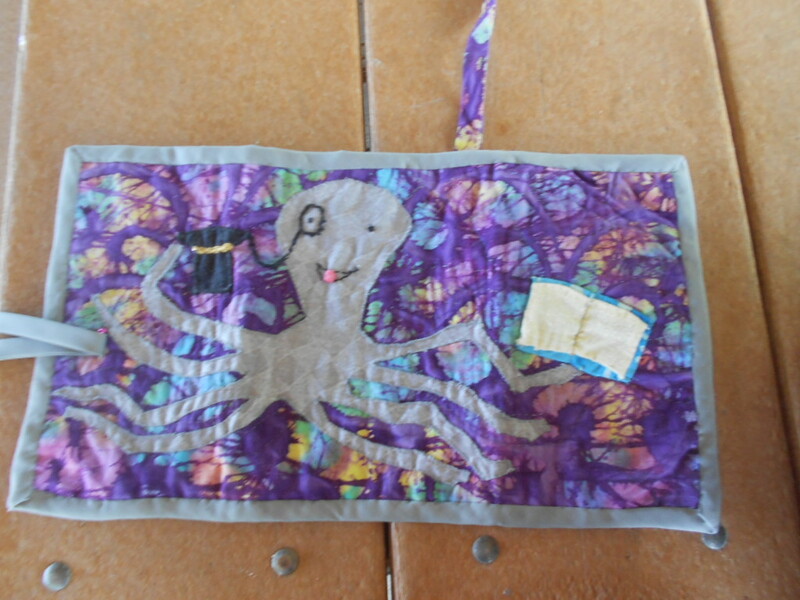 Once I finished the quilting, I cut out and pressed under the seems of the octopus, and I proceeded to applique him using a whip stitch. It was a first attempt, and I was jumping in both feet first. Later, when I researched sewing the binding, I realized I could have made a blind stitchch work. I considered a ladder stitch, which I often use for closing pillows and blankets, but I went with the whip stitch. We’ll say it looks like his tentacles for the most part. I am still knitting and will have to keep at this sock. I am one-third of the way done with the first leg and suspect if I devote a little time to this sock each day off, it will progress once again. I’ll take sewing/quilting to work as its easier to accomplish on short breaks and some of my other quilting projects have to stay secret. I may write down my musings and translate them to blog fodder later, after Christmas;-). Scamp will still help me some. She has throughout this process, but I photographed the quilted book wrap at the park today where I held my birthday party.